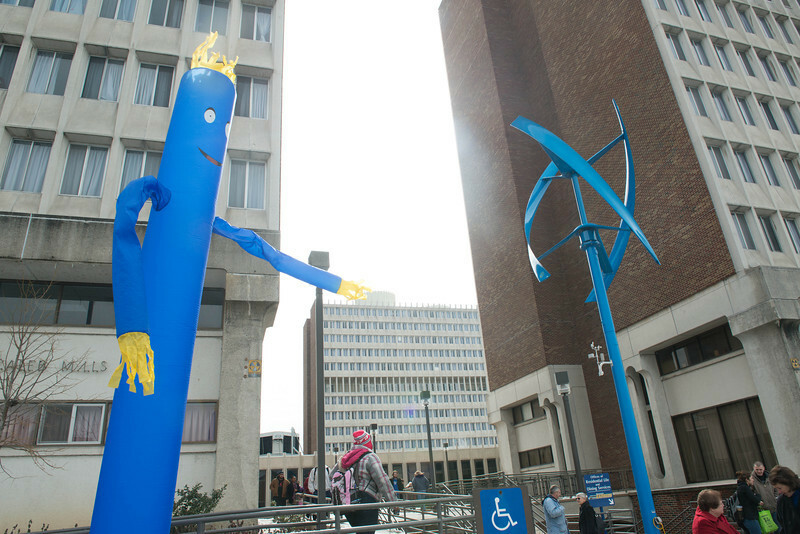 At Indiana State University, they call the wind "Helix." Well, at the least the turbine powered by the wind they call "Helix." On Friday (Feb. 22), university officials and students flipped Helix to "on" during a dedication of the vertical turbine that the wind spins in front of Rhoads and Mills Residence Halls. During the dedication officials also unveiled the winning name submitted by sophomore Brett Ferry for the turbine in a contest that generated more than 200 submissions. The turbine in ISU blue looks more like a modern art sculpture than science and sustainability in action set 30 feet off the ground. As wind catches the vertical curved blades of the turbine, it rotates them to generate between 5,000 and 11,000 kilowatts annually to offset some of the university's energy usage. Indiana State President Dan Bradley noted that the turbine grew out of the university's Strategic Plan with its "commitment to apply the science of learning to the learning of science" by allowing students to gain hands -on experience in science and through the development of the Institute for Community Sustainability, which is an Unbounded Possibilities initiative. "From inception to completion, the wind turbine has been a university-wide project with a strong focus on environmental science and applied conservation education," Bradley said. The turbine moves the university forward on its Climate Action Plan, which guides the university toward carbon neutrality by 2050 by examining university life with its food systems, energy systems and buildings before proposing ideas toward becoming more sustainable in the future. 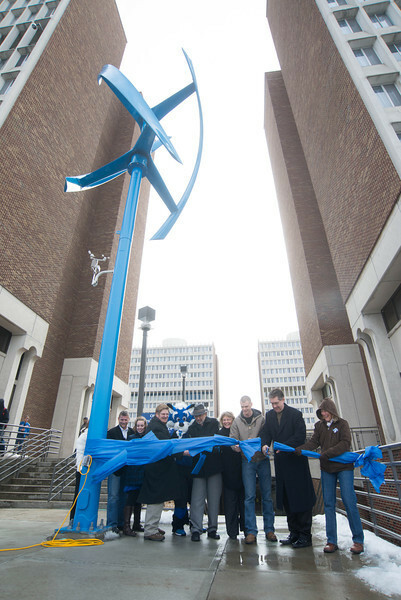 "The wind turbine is a symbol of ISU's commitment to sustainability. It is just one small piece of the sustainability work that we do, but it is a prominent one being located north of the freshman dorms and visible from the fountain," said Jim Speer, the director of the institute and professor of earth and environmental systems. Terre Haute Mayor Duke Bennett praised the university's sustainability efforts. "You continue to do things every day that set the pace for us," he said. Professors teaching Environmental Sciences 110 classes involved the 450 students during their lab and lecture times by giving them hands-on experience in scientific fact finding. Throughout the 2010 fall semester, students could be found in small clusters with one patiently holding an arm above the head while another held a notebook with data and another timed the wind measurement. Students caught the wind in anemometers to measure its speed at 50 points across campus in order to determine the best location to place the windmill. While students' lore had it that wind swirled and swept around the Statesman Towers, now science backs that with fact. "Wind turbine installations tend to take place in rural areas, where buildings don't obstruct the wind that powers turbines," Bradley said. "Since the university's landscape is predominantly urban, more than 400 students collected information about wind speed and direction on campus to ensure the best possible placement. I want to thank the students and faculty members of the fall 2010 Introduction to Environmental Science and the spring 2012 Conservation and Sustainability of Natural Resources for their work on this project." Sabrina Brown, an Indiana State junior, conducted research into wind speeds and wind production in Terre Haute comparing data collected in the 1960s with data collected by students in the 2010. She has presented her climatological research at a national conference and been asked to publish a paper about her research. "To me, the coolest thing about the wind turbine project is that students participated in every step of the process. This project helped students learn about how to implement solutions to real-world problems," she said. "I can't wait to come back in 20 years and say ‘I had something to do with that.'" Speer said students will continue to learn from the wind turbine. "They're teaching tools for us at ISU," he said. "So the College of Technology can participate and look at those windmills. The earth and environmental systems department can look at the windmills and work with those to see how they're productive for alternative energies, how they've off set our energy at ISU." By getting the students involved, Speer said the hope is that it has a long-term impact on students. "By getting them (alternative energy options) in the classroom, getting them in front of students, getting the students participating in the science behind it, really helps pass that along to the next generation," he said. "If we really want to make any energy conservation changes on campus, we need to involve the 12,000 students on campus and make it not just a facilities change, but make it a community change at ISU." University officials and students flipped Helix to "on" during a dedication of the vertical turbine that the wind spins in front of Rhoads and Mills Residence Halls.